Raw Banana is one of my most favourite vegetables. I love making everything with this delicious vegetable from kofta curry to dahi vada. 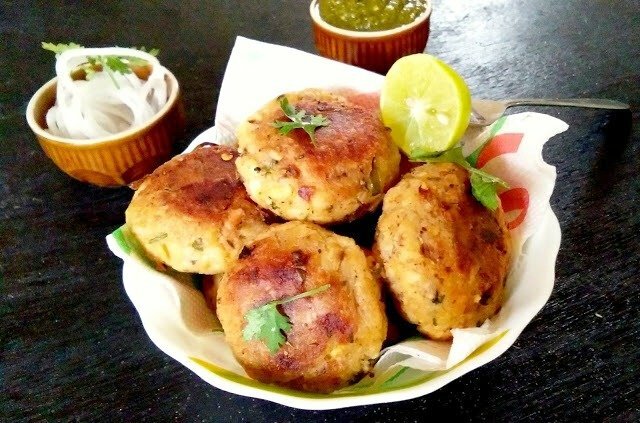 In this recipe, I have used raw banana to make tikkis/kebab which is delicious evening snack. Raw Bananas are cooked, grated and spiced with Indian spices like cloves, cardamom and cinnamon powder and stuffed with chopped dates to balance out the flavours of the spices. Serve Raw Banana Tikkis along with Dhaniya Pudina Chutney and a cup of Adrak Chai for a light and healthy evening snack. You can also serve this as an Indian Starter for dinner parties.